What is the Donjoy ArcticFlow Foot & Ankle Wrap? Foot & Ankle Wrap for use with a Cooler (available separately) to relieve Foot & Ankle pain and swelling. The Donjoy ArcticFlow Foot & Ankle Wrap works with a Cooler (available separately) to relieve Foot & Ankle pain and swelling. It's incredibly simple to use at home. Just fill the Cooler with ice and water. The Cooler holds 3.5 litres of water and ice - enough for three hours of ice therapy - a much longer therapeutic period than an ice pack. The Cooler is attached to the latex free elastic Donjoy ArcticFlow Foot & Ankle Wrap which snugly fits the Foot & Ankle. 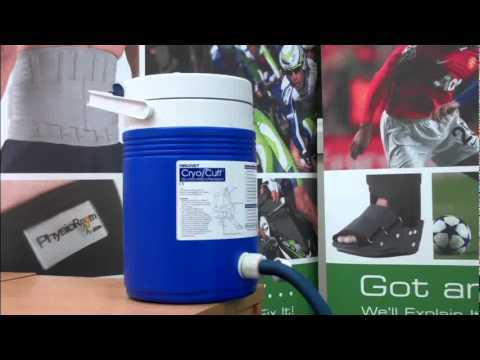 Simply elevate the Cooler above Foot & Ankle height to fill the Wrap with ice cold water to provide ice therapy and compression. USE: Foot & Ankle Wrap for use with a Cooler (available separately) to relieve Foot & Ankle pain. COMMON CONDITIONS: Foot sprain, broken foot, sprained ankle and Lisfranc injury. COOLER: The Cooler holds 3.5 litres of water and ice - enough for three hours of ice therapy. Donjoy ArcticFlow Foot & Ankle Wrap - Cold Therapy for Pain Relief & Foot/Ankle Support is in stock and available for immediate dispatch from our Warehouse facility in Lancashire, UK. Orders placed by 4pm Monday to Friday (excluding Bank Holidays) are dispatched the same day. If you need your Donjoy ArcticFlow Foot & Ankle Wrap - Cold Therapy for Pain Relief & Foot/Ankle Support in a hurry, next working day delivery is available for UK mainland addresses.